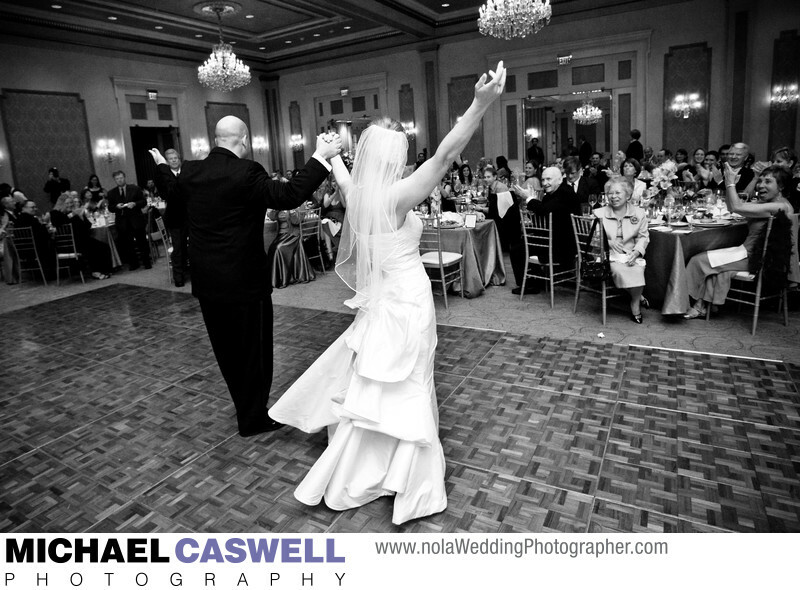 In this timeless black and white photograph, captured during a reception at the Royal Sonesta New Orleans Hotel on Bourbon Street, the couple takes a celebratory bow at the conclusion of their first dance as husband and wife and acknowledges their cheering friends and family. While hiring an experienced wedding coordinator is a great idea, this bride was herself a talented and detail-oriented event planner based in Ohio, and was largely responsible for putting together this truly spectacular wedding. After some bridal prep shots and formals at the Royal Sonesta, we headed over to nearby St. Jude – Our Lady of Guadalupe Chapel at the edge of the French Quarter for the ceremony. After the ceremony, the Storyville Stompers brass band led the newly married couple and their guests on a second line parade through the French Quarter back to the Royal Sonesta. The elegant and spacious ballroom was beautifully set up for the reception, having been decorated by well-known local floral designer Meade Wenzel. New Orleans band Burgundy provided the entertainment.